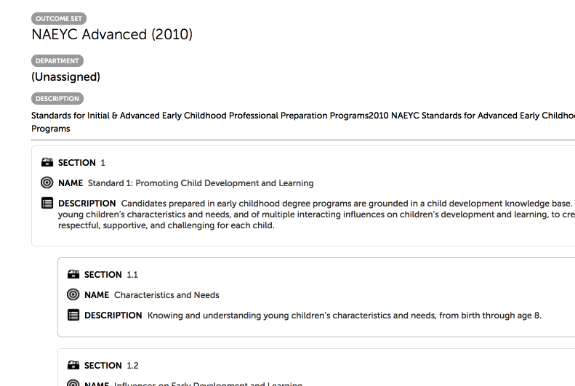 Entering standards into Chalk & Wire can be a time consuming process. However, with the new Import Standard Set feature, the task has been streamlined and made much easier. 4. Click the Import Outcome Set button. 6. (Optional) Enter a Description for the Outcome Set. 7. 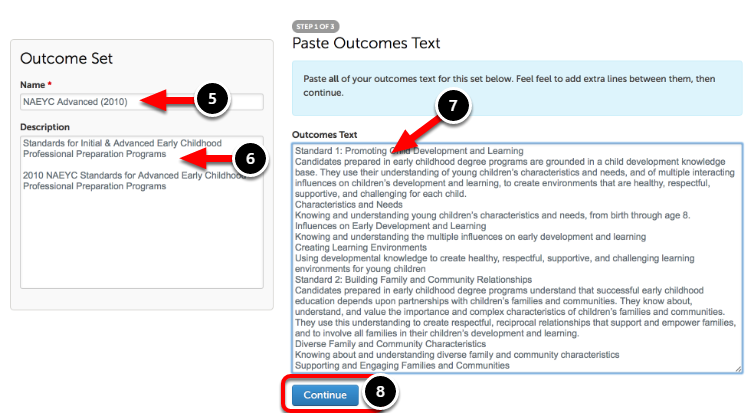 Paste the entire Outcome Set into the text box. If the Outcome Set is in a chart, or contains performance levels, you will likely want to edit the content before clicking continue. In order to eliminate more tedious editing later, ensure that each Outcome TITLE is on its own line and each Outcome DESCRIPTION starts on a new line below the title. 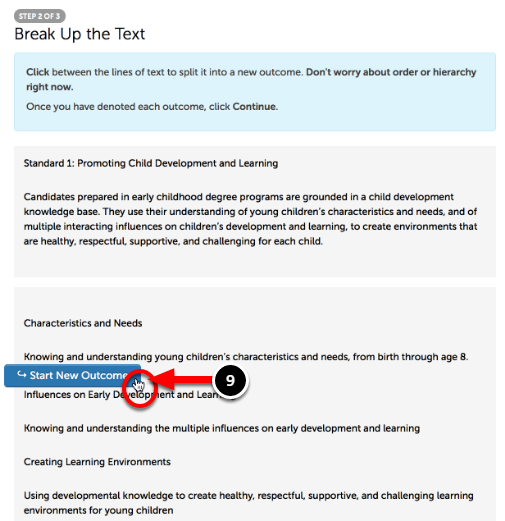 'Breaking up the Text' refers to the process of separating Outcomes and Outcome Sub-Sections. Each broken-up section should contain the Outcome title, and description. 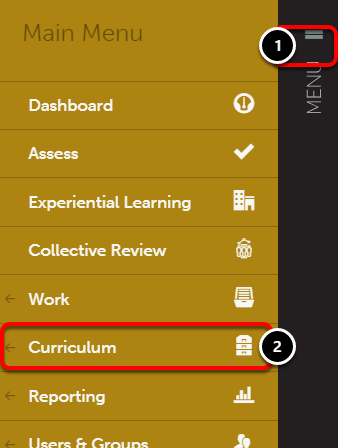 Use your cursor to hover over the break between two Outcomes. 9. Click on the blue Start New Outcome button. 'Organizing your Outcomes' refers to organizing the Outcomes and Outcome Sub-Sections into the correct hierarchy. 11. 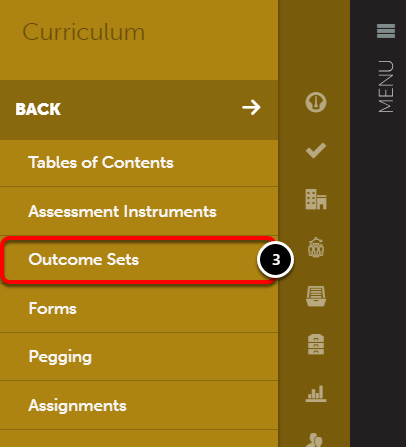 Outcomes can be nested within one another by clicking on the vertical dotted bar on the outcome and dragging-and-dropping it to the right. 12. Click the Save Outcome Set button. 13. The import will be confirmed in green. In order to view the newly imported Outcome Set, click on the Click here to view link. 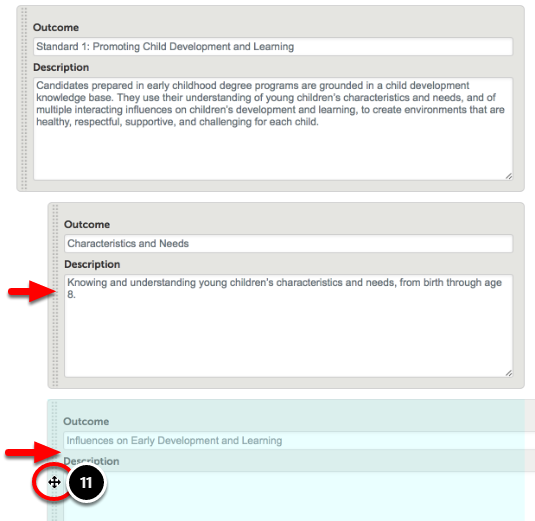 The Outcome Set will appear in a 'View' Mode and will not be editable. If you would like to edit the Outcome Set's content or add it to a Department, please visit our Edit an Outcome Set page.